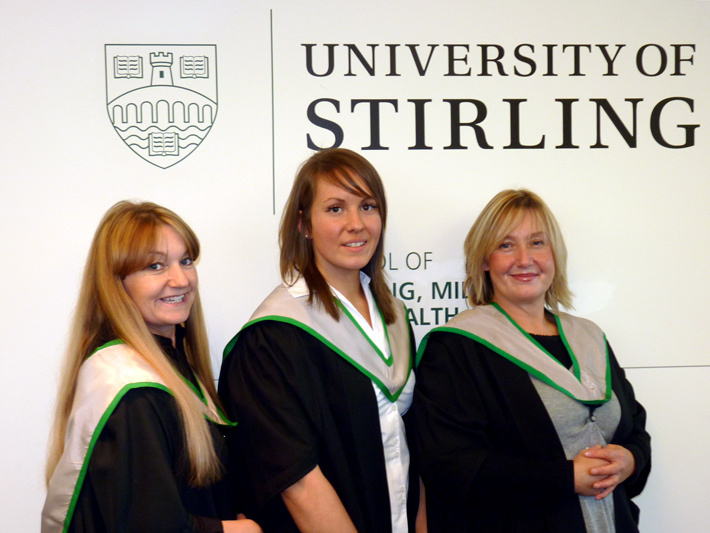 Three student midwives who graduated from the University of Stirling on 2 November marked the end of the last 18 month accelerated, registered midwifery programme in Scotland. The graduates took part in a ceremony at St Andrew’s Cathedral in inverness, where more than 150 students from the University’s Highland and Western Isles campuses were awarded their degrees. During the ceremony Dr Winifred Ewing was awarded Doctor of the University, in recognition of her outstanding contribution to politics and her role as a model for women in public life. Dr Ewing’s Honorary Degree was conferred in absentia. During the last three years, Stirling has been the only University in Scotland to offer the unique 18 month shortened programme for registered nurses to train to become registered midwives. As part of the course, the student midwives observed midwifery practice in a wide variety of settings, including many remote and rural areas within a large geographical region. This helped demonstrate the differences between consultant-led care such as that available in the maternity unit at Raigmore Hospital, midwife-led care in the community, and midwife-led units where they had observed first-hand the decision-making skills of midwives working in often isolated situations.